Romantic David Beckham gushed about wife Victoria at the Teen Choice Awards over the weekend, describing her as an ‘amazing’ person and mother. The soppy sports star attended the swanky LA ceremony with his three sons, stepping up on stage to collect an award for best sportsman. But it seems Victoria was the only thing on his mind during the industry evening. Asked about the fashionistas best attributes, he said: ‘There are so many things – I think the main thing is she’s an amazing mother. 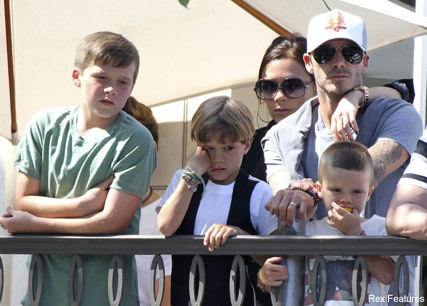 And Becks revealed the secret to their 11-year marriage is hard work. ‘We’ve been married 11 years and we make it work. We make time for each other,’ he said.